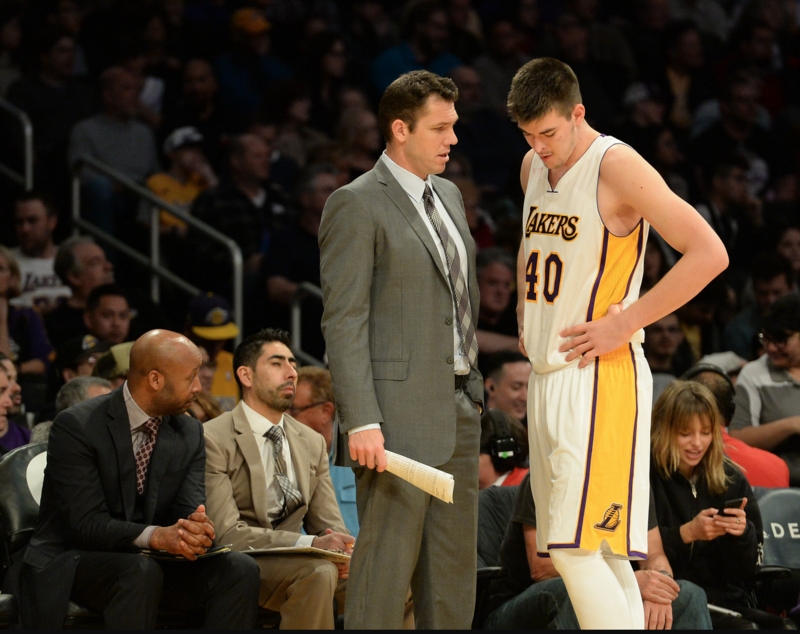 After an MRI confirmed a high ankle sprain in his right ankle, Lakers center Ivica Zubac will miss the remainder of the 2016-17 season. The Lakers are exercising caution for obvious reasons. After selecting him with the 32nd pick of the 2016 NBA draft, the Lakers view Zubac as a worthy long-term investment. But the news marks a missed opportunity in which the Lakers and Zubac could continue his steady growth with their seven remaining regular-season games. Zubac gave the Lakers plenty of optimism with his long-term trajectory with his post presence, hook shot, mid-range jumper and defense. While averaging 7.5 points on 52.9 percent shooting and 4.2 rebounds, Zubac also impressed the Lakers with his steady growth, work habits, improving his conditioning and losing weight. MINNEAPOLIS — In something that has become a rarity all season, the Lakers initially followed their defensive scouting report. With the Lakers facing a Minnesota Timberwolves team that features a versatile big man (Karl-Anthony Towns), a versatile wing (Andrew Wiggins) and a dynamic playmaker (Ricky Rubio), the Lakers narrowed their priorities on how to defend Minnesota’s three best players. Lakers coach Luke Walton considers Towns and Wiggins as “players that can get 30 [points] on any given night.” Walton views Rubio as “more of a facilitator,” matching the league-wide perception that his passing becomes much more dangerous and consistent than his shooting. But as the Lakers tried to take away one thing, they wound up giving up everything. The Lakers lost to the Minnesota Timberwolves, 119-104, on Thursday at Target Center with Towns, Wiggins and Rubio scoring mostly anytime they wanted. Rubio posted a career-high 33 points while shooting 12-of-20 from the field and 4-of-5 from 3-point range and adding 10 assists. Towns added 32 points on a 11-of-22 clip and nine rebounds. And Wiggins contributed with 27 points while going 9-of-20 from the field and 8-of-10 from the free-throw line. Yet, Walton became more upset with how the Lakers defended Rubio than how they defended Towns and Wiggins for one specific reason. That’s because Walton found the team’s lack of defensive communication playing a significant part in fueling Rubio’s hot shooting night. He has plenty enough to keep him busy coaching the Lakers (21-53) entering Thursday’s game against the Minnesota Timberwolves (29-44) on Thursday at Target Center. Though Walton had not heard Buss say those words on a podcast, the Lakers’ coach said he has heard Buss say those words in other instances. 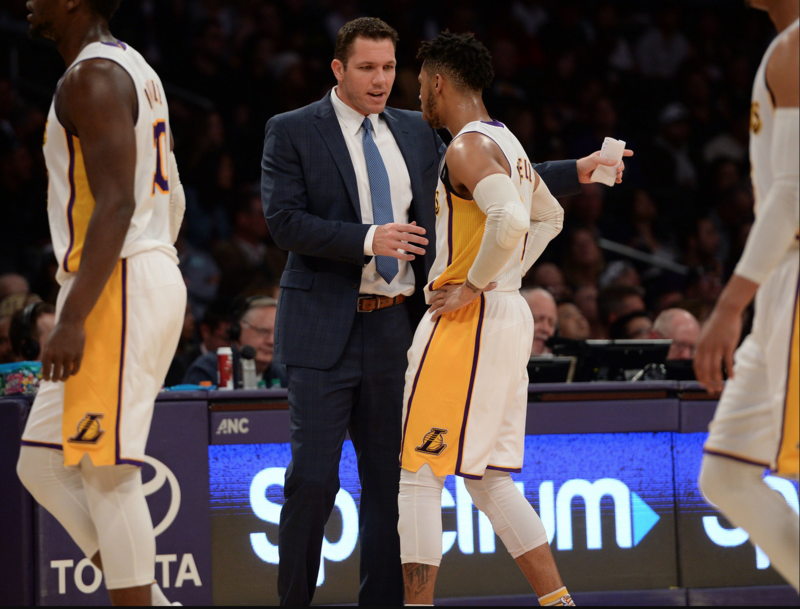 Ever since the Lakers hired Walton in the 2016 offseason after serving as an assistant coach with the Golden State Warriors for the previous two years, Walton said Buss has “been incredible” as she has offered support as they talked in person or via text message. As she pondered hiring Magic Johnson first as an advisor and subsequently to oversee the team’s basketball operations, Lakers governor Jeanie Buss pressed Johnson on one specific topic to make sure they held similar views. It turns out Johnson agreed with Buss with as much conviction as the beliefs they share in holding the previous front office in Jim Buss and Mitch Kupchak largely responsible for the Lakers two weeks away from missing the NBA playoffs for the fourth consecutive season. MINNEAPOLIS – Shortly after practice ended, Lakers rookie forward Brandon Ingram performed a series of stretches to extend his range of motion. He then took a few shots. All of which marked the extent in which Ingram participated in Wednesday’s session after missing the past two games with tendinitis in his right knee. Since Lakers coach Luke Walton has wanted Ingram to complete a full practice before returning, Walton considered it “most likely” Ingram will sit when the Lakers (21-53) visit the Minnesota Timberwolves (29-44) on Thursday at Target Center. Still, Walton did not entirely close the door on Ingram’s return. 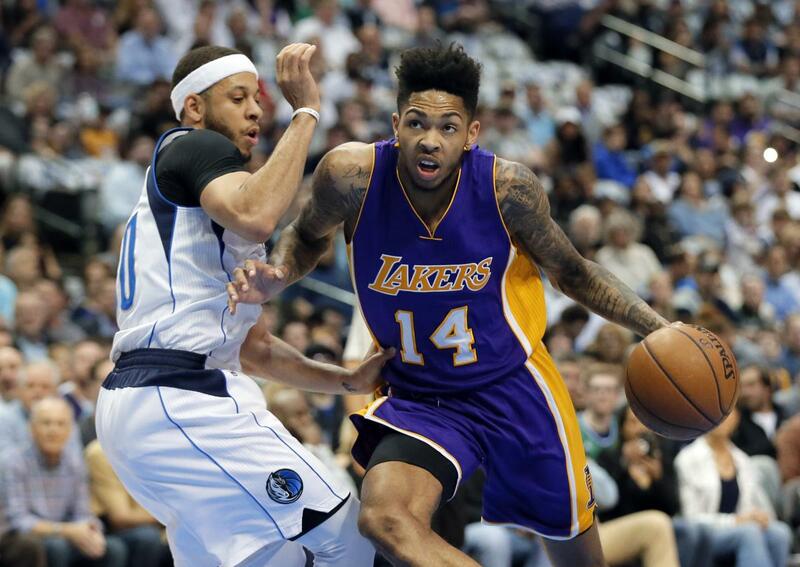 Ingram plans to receive more treatment and complete an evening workout. While Ingram is not currently ready for any three-on-three drills, the Lakers could increase Ingram’s workload during Thursday’s morning shootaround and prior to tipoff. EL SEGUNDO — After rarely showing any signs of fatigue during his rookie season, Lakers forward Brandon Ingram will miss his second consecutive game on Tuesday against the Washington Wizards because of patellar tendinitis in his right knee. Ingram will travel with the Lakers for Thursday’s game in Minnesota, but it’s not currently clear if he will play. The Lakers plan to practice in Minnesota on Wednesday in what would mark Ingram’s first practice since injuring his knee at the end of Thursday’s practice. 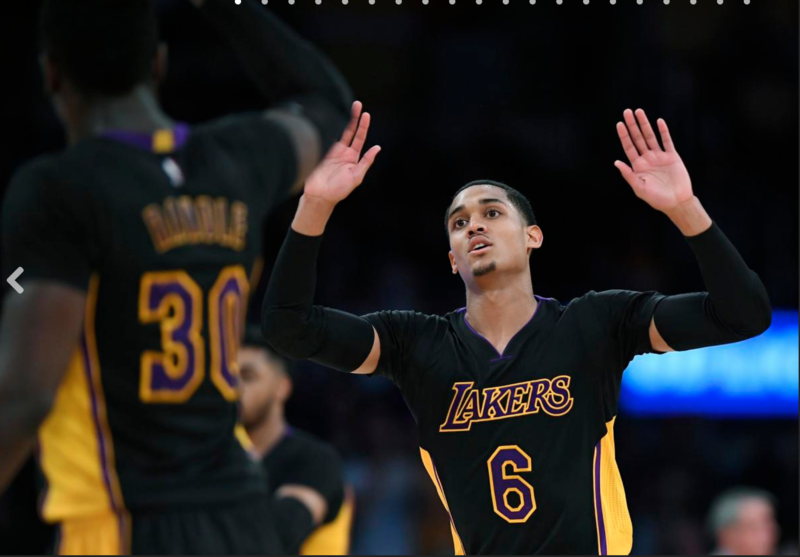 Although he played on Friday against Minnesota, Ingram sat out the entire fourth quarter and overtime period after feeling more pain in his knee. LOS ANGELES — The ball went up in the air. 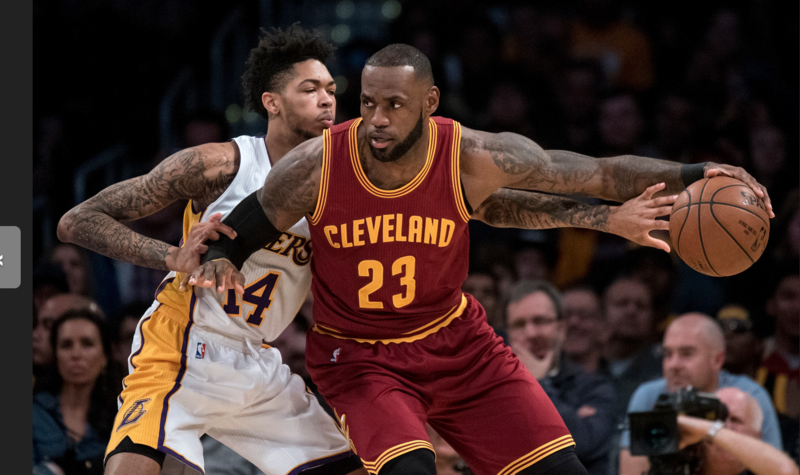 So, of course, that meant Lakers forward Larry Nance Jr. would chase it. After all, there’s never a hustle play that Nance decides to take off. But that also set up a collision course for Nance. With Lakers guard D’Angelo Russell throwing a cross-court pass toward Nance in the final minute of Friday’s overtime win over Minnesota, Timberwolves forward Gorgui Dieng poked Nance in the eye and nose in hopes to grab the ball. Nance immediately went to the ground as he nursed a bloody nose and plenty of dizziness. 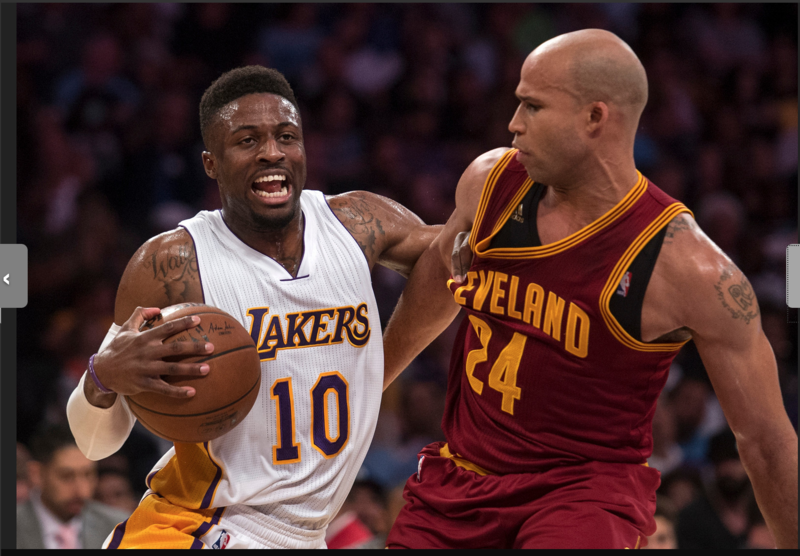 Instead, the crowd at Staples Center saw Nance provide another example of his toughness. Instead of leaving the game, Nance stood up and went to the foul line. Though he later lamented he only split his pair of free throws, Nance deserves kudos for even stepping to the foul line and taking them. Nance also made a pair of foul shots in a Lakers’ win against Phoenix on Nov. 6 after taking a hard fall that later developed into a concussion. With the Lakers eager to collect as much data for evaluation purposes, they considered it more valuable to retain undrafted guard David Nwaba than to sign another player to a 10-day contract. The Lakers signed Nwaba on Tuesday to a two-year deal, including a team option for the 2017-18 season, according to a league source familiar with the terms. While Nwaba is guaranteed to be with the Lakers for their remaining 12 games of the 2016-17 season, the second year of his deal is non-guaranteed. Nwaba, who starred at University High of Los Angeles and Cal Poly San Luis Obispo, averaged 3.6 points and 2 rebounds while shooting 48.1 percent in 14.4 minutes through 10 games (eight as a reserve and two as a starter) during two 10-day contracts. He previously played with the Lakers’ Development League affiliate, the D-Fenders, where he averaged 14.1 points, 6.9 rebounds, 1.4 steals and 1.0 blocks in 29.0 minutes per game. 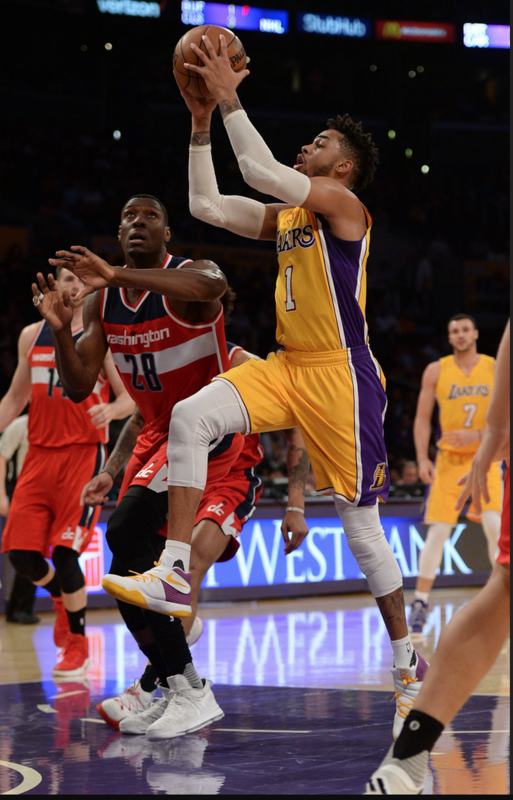 Can Lakers’ D’Angelo Russell build on 40-point night?